This seems like a solid upgrade to the anti artifact hatebears out there (Tin Street Hooligan, Torch Fiend), it also blows up bridges and kills most creatures in the format. While I don't see a dedicated deck that would play it (maybe a sideboard in Mono Red?) It might be worth a look, any thoughts? Also takes out new Karn pw. As well as Ugin. I guess he does hit all Eldrazi if that becomes a thing in Vintage again. I like him a lot, and a case could be made for him over Abrade in the sideboard. Against Shops he lets you use your mana more efficiently by playing him as a 2/2 blocker until a prime target presents itself. Against Dredge he still hits most relevant creatures (Stinkweed Imps on blocking detail, Hollow Ones, e.g.) and as a bonus can do so while chump blocking, and also exiling all Bridges. Is this really an upgrade over Tin-Street Hooligan? Tin street costs RG and leaves a 2/1 creature in play ... most of the time this costs 2R to get a sorcery-speed shatter, an effect that wouldn't be played at R (and is in fact, too bad to be printed). This is more versatile against non-Workshop decks, but against Workshops this seems than the unplayed Tin-Street, Manic Vandals, Keldon Vandals, and doesn't compare favorably to a Shattering Spree. I think for this card to be seriously considered, the non-artifact kill parts of the card need to be relevant (as the artifact-kill parts are underwhelming). I think you're looking at a deck that wants the versatility in the main, something that has particular problems with X/2s, or as @Serracollector suggested, a metagame shift that makes either Eldrazi or Karn more popular. @brass-man I’d certainly consider it in Survival! A nice way to kill Cage and Priest in the same card sounds pretty decent! Applications against Shops and Dredge (especially post board) too. @wfain good call ... "a deck that can tutor up a creature and needs a way to kill both Containment Priest and Grafdigger's Cage" is exactly the sort of scenario I was talking about, and I can see where in that deck, maybe this frees up a card or two. The more I think about this, the more I dislike the card against Workshops specifically. I don't think anybody here was really claiming this card is a Workshops killer, but I feel like soapboxing a little. You're spending three mana, which for you is 2 to 3 turns worth of mana development, to kill a single card which costs them 1 turn of mana development. 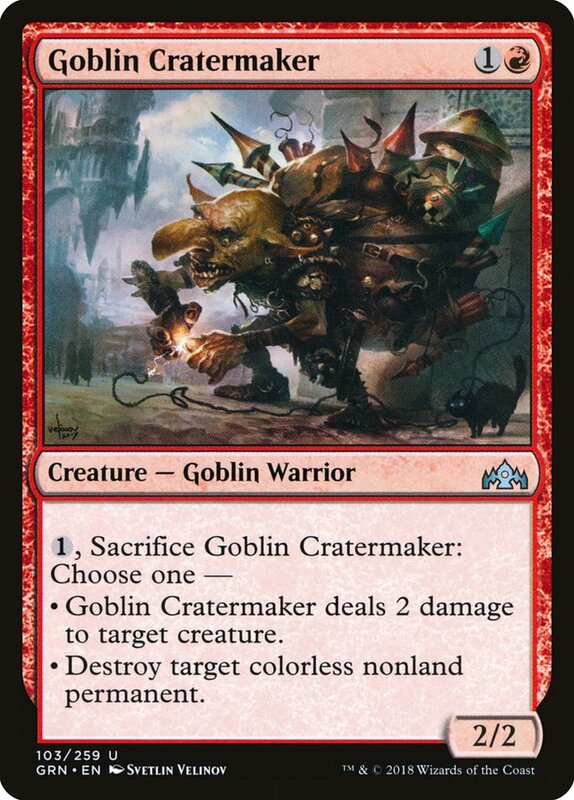 If that card is an Arcbound Ravager or Walking Ballista or Hangarback Walker or Precursor Golem, they still get some value out of the card, so you're trading 1 of your cards for less-than-1 of theirs. This puts you behind on both tempo and cards. This is actively bad against Workshop, you are worse off when you play this card, the same way you'd be worse off running Stone Rain against Lands or Fade from Memory against Dredge. Basically, the card is just "not dead". Since this is constructed and we have to handle multiple decks, sometimes (often, really) we have enough even worse cards like Flusterstorm that "not dead" is a better alternative. Still, large numbers of these sorts of cards are a kind of "deck smell" (in the way that programmers use the term "code smell" ... I suspect there's a better term for magic, but I think it's useful ... something that isn't necessarily bad in and of itself, but usually means there's some problem nearby). The more of these you have the WORSE your Workshops matchup is, a deck with 40 Goblin Cratermakers and 20 lands basically couldn't win a game unless the Workshops player had serious mana trouble. @Brass-Man I think that's a really good point. Now that I look at this card I think its a bit too much of a compromise to be worth running in any one situation.